The Club promotes various Championships for which an award is presented to the competitor who gains the most points over the duration of the Championship. The Championships are open to all fully elected members (and junior members for the Junior Championship) of the Club and normally run from January to December of each year. Only fully paid up members of BAC will be allowed to contend in Championships and accumulate points. Points cannot be claimed prior to date of membership. Members must be able to produce a valid Membership Card prior to entering any event or present a completed membership application accompanied with the correct subscription fee. In the event of any disputes concerning the allocation of points, the Committee’s decision will be final. 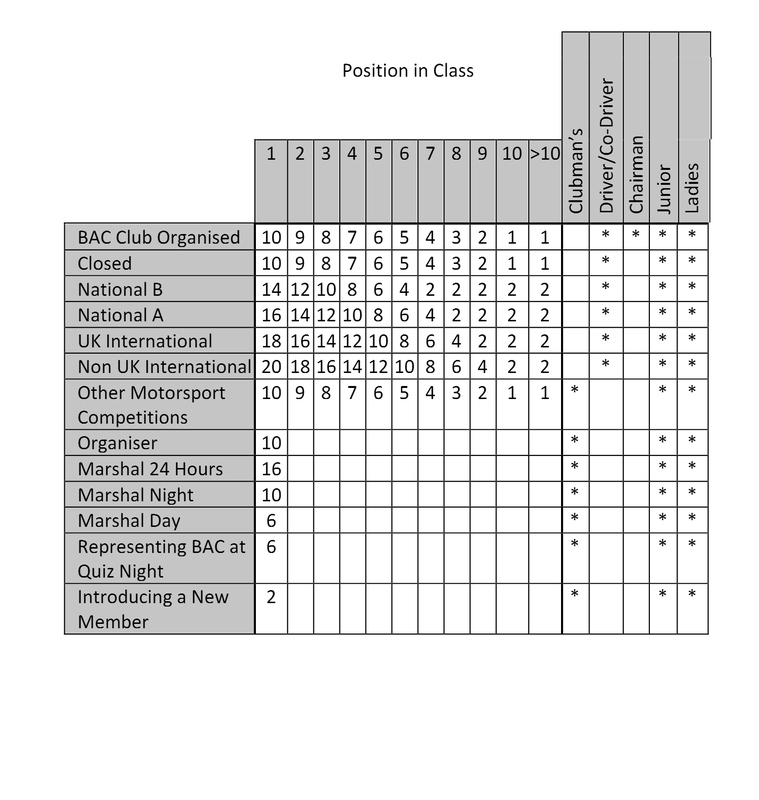 All points must be claimed in person (or by relatives for junior members) on a Club night on the official BAC claim form within 4 weeks of the event date, accompanied by proof of results for competitive events. Claims should be made to the Results Secretary. If the Results Secretary is not available, the form should be given to a member of the Committee. The Championship will cover all activities that contribute to the functioning or promotion of the Club but excluding competing in Motorsport events. Organisers may also be competitors and attract points in other relevant Championships. Only one organiser for any one event is eligible to claim points. Points for competing in events toward the Championship are allocated in accordance with the matrix at the end of the section. The Championship will cover drivers competing in all classes of Motorsport sanctioned by the MSA, this will include but not be restricted to navigational scatters, sprints, PCTs, autotests, rallies, races and off road events. For events to be eligible for this Championship, they must be open to any competitor holding the required license. Points will be awarded on the basis of the least category of license required to compete in the event. To claim points, competitors must be classified as finishing the event. Points are awarded on a position in class basis. The Championship will cover co-drivers competing in all classes of Motorsport sanctioned by the MSA, this will include but not be restricted to navigational scatters, rallies, races and off road events. For events to be eligible for this Championship, they must be open to any competitor holding the required license. Points will be awarded on the basis of the least category of license required to compete in the event. To claim points, competitors must be classified as finishing the event and the claimant must have been the co-driver for the entirety of the event. Events where co-drivers are allowable but not mandatory will not attract points in this Championship. The Championship will cover the activities of junior members (under 17 years of age at date of membership commencement) in all forms of Motorsport and activities related to the Club. Junior members can only claim points in the Junior Championship. Junior members who reach 17 years of age during the membership year may upgrade their membership to full membership but cannot commute points awarded prior to upgrade date to other Championship or continue to claim point in this Championship. The Championship will cover competitors (drivers and co-drivers) competing in BAC organised events only. Points for this Championship are also included in the drivers and co-drivers Championships as applicable. To claim points in an event you must be classified as a finisher. Points for external events must be claimed using the claim form with proof of finishing provided. Points for BAC organised events will be allocated automatically. A junior is defined as under 18 at the time of joining or renewing. The Autotest (Specialist) championship is only applicable to senior members. Juniors in specialist vehicles only attract points toward the junior championship. Up to 3 organisers per event may claim points at discretion of lead organiser. For BAC organised events (Including Juniors), not all events will count toward the championships as defined at start of year. E.g. best 12 of 15 will count. Non-motorsport competitions are other competitions with a final ranking that do not involve a motorised vehicle, e.g. quizzes. In the event of further clarifications being required, please refer to the committee. The allocation of points will be reviewed from time to time, but only by exception and with the approval of the Committee will allocations be changed mid-Championship. If you have any suggestions for rule amendments, please email The Club Secretary.